I’ve been using this recipe for several years now. It’s our favorite pizza crust. I got this online, but the site isn’t up anymore, so I can’t link to it. Dissolve yeast in water and add sugar. Wait a few minutes, then add oil, salt and garlic. Mix in 3 cups flour and whip about 10 minutes until it leaves the side of the mixer bowl. Add remaining flour with dough hook or by hand. Knead on floured surface until smooth. Allow to rise in bowl for an hour. Divide dough and place into pizza pans, or baking sheets. Let rise for another hour, or less if you want a thinner crust. Top to your liking, and bake at 425* for 20 minutes. *NOTES: Since my stand mixer died, I have been using a wooden spoon to beat the dough for a couple of minutes, and the crust comes out fine. Here’s our Cheeseburger Pizza from the other night. I topped the crust with sauce, mozzarella cheese, raw diced onions, cooked hamburger and a sprinkling of cheddar cheese. We also use the pizza dough to make bread sticks. 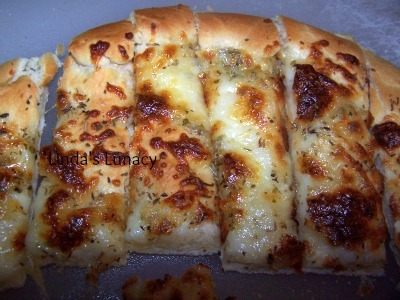 I sprinkle the dough with mozzarella cheese and dry oregano. Bake at 425 approximately 15 minutes, until crust is done, and browned to your liking. Here’s my favorite pizza sauce to make while the dough is rising. Saute onion in oil until cooked, but not browned. Add the rest of the ingredients. Simmer for at least 5 minutes. 10 – 15 minutes is better, if you have the time. You can adjust the seasonings to your taste, and you can use crushed garlic instead of the powder. Yummm! Pardon me while I wipe the drool off my keyboard! That looks YUMMERS!! I might have to try that. This crust looks really good! I think I'll try it with the lasagna pizza I plan to make today or tomorrow. That looks like a great pizza crust.Thank you for sharing and you have a great week! Ohhh! I have been looking for a yummy pizza crust recipe! Thanks~ I will try it this week! Wow this looks good, another one to save in my bookmarks. Looks fantastic! Will definitely have to try this recipe! We love pizza in our house too! After all I didn't get this svelt figure eating salad! ;-) Thanks for playing along! Oh garlic crust sounds divine! We love making homemade pizza here too, so we'll definitely give your recipe a go! Thanks for linking up and playing along for our Friday Food Fight. I know you are a faithful Thrilling Thursday linker, THANKS FOR THAT! I just wanted to pass the word along about Paisley Passions NEW linky party Fun w/Food Friday where you can come and link up your food posts! Here from thrilling thursday, thanks! This does look yum. I'd love to do my own breadsticks sometime.